For over 100 years, a concept has been posited that the most consummate composers, conductors, and musicians know how to employ tense silence to express loftier orchestration, allowing anxiety-inducing pauses to become auditory palate cleansers. And for his Cacophony solo exhibition, artist Kyle Kirwan explores a visual rendition of this notion, his predominantly white works creating a subtle sculptural topography against the sheer gallery walls, pops of well-spaced coloration shocking the gaze in this sea of pallidity. A potentially discordant mix of vibrant notes and stark minimalism, Kirwan’s Cacophony avoids from straining the eyes while succeeding in creating a thoughtfully spacious atmosphere. Towering over the window display was The Fresh Final Willo, the dominance of this fairly recent form announcing to the initiated that this exhibition would focus upon Kirwan’s creature creations from his fictional world of Dor narrative (learn more here). The Final Willo form was introduced earlier this year, a skull-encrusted sculpture depicting a divine being inhabiting a normally docile Willo beast’s dead body. With its antlers and tattered wings presented in black, this otherwise white form had its oozing arm formations decorated in several neon colors, their vibrancy reminiscent of the stringy strands that emit from a Play-Doh Fun Factory‘s press. Initially introduced by Kirwan in 2016, the Bloom creatures usually flock alongside Willo herds within the artist’s fictional narrative. Typically depicted as balls of conical fur with a pair of dot eyes on their exposed faces and elongated legs ready to race to food sources, Kirwan has frequently revisited the form and evolved it to encompass a variety of alterations. 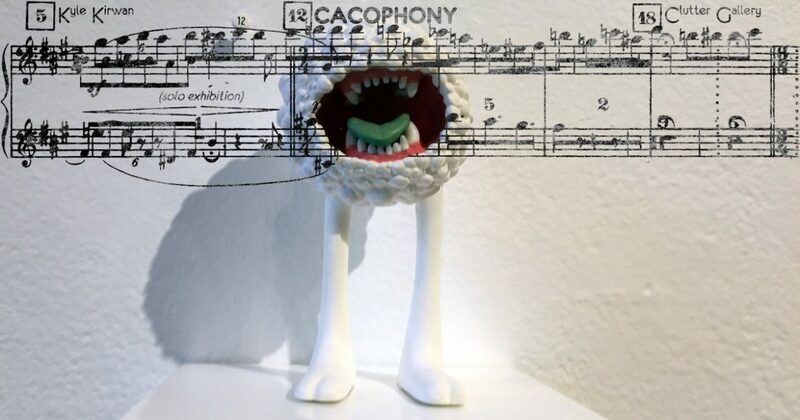 And, with the Cacophony exhibition, the artist provides insight into the next evolution of these beasts through a series of nine new Bloom renditions. Each maintaining the basic profile of the initial creation, they expand the concept of what a Bloom can be through both subtle and severe alterations. Using Kidrobot‘s Dunny form as a base, Kirwan hand-modified the existing sculpt into something uniquely his own, which he titled the Huskling. And while the -ling suffix can denote a miniature or immature version of something, here it seems used to describe something in terms of a particular quality it has, specifically its textured husk, or outer covering. Carefully creating a complex landscape of creases and pores, its slightly agape mouth presents as a reddish gash across the creature’s face, sharp teeth in a rotten black threateningly jutting forth. Seemingly eyeless from the front, traversing to the backside of the beast reveals a massive array of pitch colored optic orbs. Furthering his hand-modified transformations of the Dunny form, Kirwan exquisitely alters the rabbit-eared shapes into renditions of his own Willo and Bloom creatures. Deceptively simple in appearance, elaborate amounts of wool tufts adorn each with smart but subtle additions, like the thin philtrum groove under the Willo‘s nose, completely recreating the forms as his own. Proceeded by an array of Bloom creations, these include the sculpturally impressive Green Tongue Bitey Bloom, the shock of color in its opened mouth attracting attention to this highly detailed piece of anatomy, and the humorously smart trio of Orange Creamsicle Mini Blooms, the shock of orange fur interrupted on the final one by a cartoonish bite mark, surely left by a creature testing if it truly tasted like the popular ice cream bar. Kirwan’s third and final evolution of the Dunny form in this exhibition is The Maw, rows of sharp teeth bisecting its body. Creating the illusion of a fearful, gaping mouth through the darkness of the recessed area, the rabbit-like ears become viewable as pinchers on this multi-eyed, insect-esque beast. Preceding this, sandwiched between the muddy colored Catacomb Final Willo and the striking Dreadful Final Willo, are a trio of uniquely hand-painted Willo forms. Embodying its name, which means fear of the sea, the Thalassophobia Willo is coated in pearlescent waves upon its hide with a serene blue adorning its face. The aptly named Spectrum Willo has a pale color palate spread across it, one tone fading slowly into the next, which contrasts beautifully against the Saskatchewan Willo‘s crisp separation of black and white sections. And these three hand-painted Willo castings are the final renditions of this form that Kirwan ever plans to publicly release, closing a door on the long-standing form from Dor while making way for new artistic adventures in the realm to bloom. Having had its opening reception on Saturday, May 12th from 6-9pm, all works in this exhibition will remain on display until June 1st, 2018 at the gallery’s physical location (163 Main Street, Beacon, NY 12508).